Jason Murphy is a Knowledge and Communications Advisor at RMIT University. He created and manages Melbourne’s Write Up (#MelbWriteUp). Jason works full-time and is undertaking his PhD part-time, a topic on which he’s written before. He’s working on a research project that critically examines the role of marketing in contemporary society. He’s previously worked in industry as a graphic designer and in the arts sector with the National Gallery of Victoria and the Museum of Contemporary Art, Sydney. What started as an effort to keep the momentum of a writing retreat moving has evolved into a small, active community of writing support. Back in May 2016, I wrote about the first #MelbWriteUp sessions that had taken place since December 2015. At that time, I wasn’t sure where things would head but was content to just go with it. It has now been a year and a half, and I thought it was a good time reflect on the initiative, its value, and the challenges. Jason Murphy is Senior Research Communications Advisor at the Graduate Research School (GRS), La Trobe University. He created and manages Melbourne’s Write Up (#melbwriteup). Jason works full-time and is undertaking his PhD part-time, which he’s written on before. He’s working on a research project that critically examines the role of marketing in contemporary society. #MelbWriteUp in full swing (during a break). Photo by Jason Murphy. 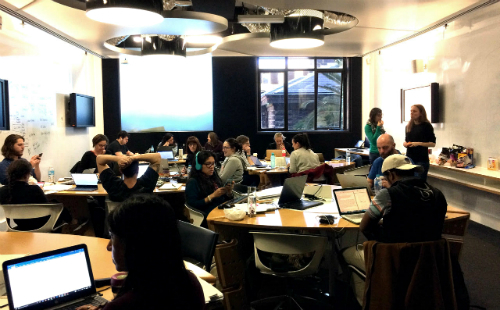 What happens when researchers with varying levels of experience and from different institutions come together in an intensive, all-day writing workshop? It’s a once a month, day-long meet-up that helps researchers focus on their work, block out all distractions (while still getting to be social), and collectively reach their individual research goals. The first #melbwriteup in December 2015 was a bit of an experiment, formed out of a conversation a month beforehand between myself (a PhD candidate) and the Research Whisperers (Tseen Khoo and Jonathan O’Donnell).